One of the underrated aspects of those hit US drama series is the cool set design. Shows from The Sopranos to Breaking Bad have resulted in many British viewers temporarily forgetting the action and enthusing over those chic American kitchen designs. You don't have to be a mobster or a crystal meth dealer to put a little of that style into your own kitchen. 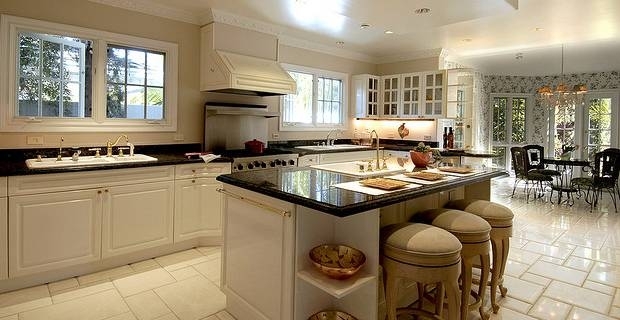 Space seems to be the key to the most impressive apect of American kitchen designs. Endless worktops (or counters, as the Americans like to call them), breakfast islands and every gadget under the sun might be an ideal, but we don't all live in palatial ranches. For those with a more British-sized kitchen, it is still possible to add a few transatlantic touches. The breakfast nook is a neat idea. This can range from a couple of bar stools next to the worktop for that snatched muesli and coffee in the morning, to a genteel corner arrangement with a bench (with storage beneath) and fold-away table. In truth, American design encompasses a whole range of possibility. The minimalist, modernist New York apartment look can involve nothing more complicated than a decent coffee machine, bare brick decor and gleaming steel fittings. At the other end of the spectrum, a rustic, retro country kitchen design can go for the full Waltons treatment, with a range, heavy farmhouse table capable of seating four generations, and maybe a log-burner in the corner for those severe Virginia mountain (or Surrey suburb) winters. Somewhere in-between, the classic New England style decor, with plenty of solid wood and natural finishes combines tradition with elegance. Even if you don't have the space and budget to go the whole hog with your American kitchen designs, a little imagination can still give your kitchen a flavour of Brooklyn or Bel Air. A print of the Chrysler building, a Seinfeld fridge magnet and a rack of peanut butter and jelly can go a long way towards maintaining the illusion.